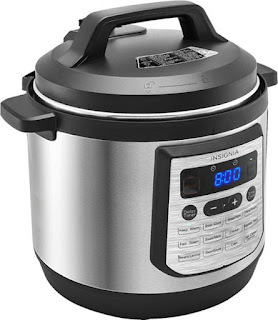 Today only, while supplies last, get this Insignia™ - 8-Quart Multi-Function Pressure Cooker for ONLY $39.99 (Retail $119.99)! Prepare healthy meals for the whole family with this Insignia 8-quart multifunction pressure cooker. Twelve one-touch preset programs simplify operation, and the heat-resistant handles let you safely move the entire unit once the food is ready. This Insignia multifunction stainless steel pressure cooker has a delay timer to plan meals around your schedule.